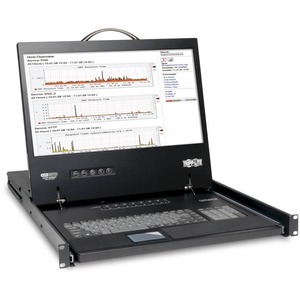 The Tripp Lite NetController 19" 8-Port VGA Console KVM Switch allows you to control up to 128 computers. The Tripp Lite B040-008-19 is a cost effective and highly flexible system that can be daisy chained with Tripp Lites stand-alone B042 NetController series KVM switches via dedicated daisy-chain ports. Switching between attached servers can be accomplished with on console push buttons, On Screen Display menu, or Hot-Key. An additional USB port is provided, allowing attachment of an external mouse to be used in lieu of the provided console touch-pad. Product Description: Tripp Lite NetController 19" VGA Console KVM Switch B040-008-19, KVM console, 19"